It has been a few months since I turned 30, which of course made me think of this fantastic rom-com with the beautiful Jennifer Garner. The movie was released 15 years ago, yet she looks pretty much the same. Such is the lives of the rich and famous. All I can do is hope I don’t turn into a turnip within the next 5 years. While watching Isn’t It Romantic with the ever-funny Rebel Wilson recently, I noticed references made to 13 Going on 30, which coughed up so much nostalgia within me. I was about 15 years old when I saw the film, so I could definitely relate to the young 13-year-old Jenna (Jennifer Garner) and her dreams of becoming a fashion magazine editor and getting the man of her dreams. However, life sometimes shows you that what you want may not be necessarily what you need, which Jenna gets to see for herself through some stroke of mysterious magic only seen in rom-coms. She suddenly finds herself waking up to a 30-year-old self, but still retaining her 13-year-old mind and innocence. Jennifer Garner is fantastic as the young, naive 13-year-old girl, showing off her acting chops as she responds to the adult world with a wide-eyed innocence. Even though we know her character hasn’t been the best person, we find ourselves absolutely rooting for her. Mark Ruffalo is too busy playing the Hulk now, but if he ever decided to venture back into rom-com territory, we would welcome him with open arms (I don’t know about you guys but I am loving the silver fox look he has got going on). He is amazingly authentic as a romantic lead, in possession of a regular every-day type of manly charm that just works. Garner and Ruffalo have such great chemistry together, which is saying a lot considering they only have about a handful of scenes in the film together. Since Jenna is the editor of a fashion magazine, we get lots of great looks and outfits from Jennifer Garner. 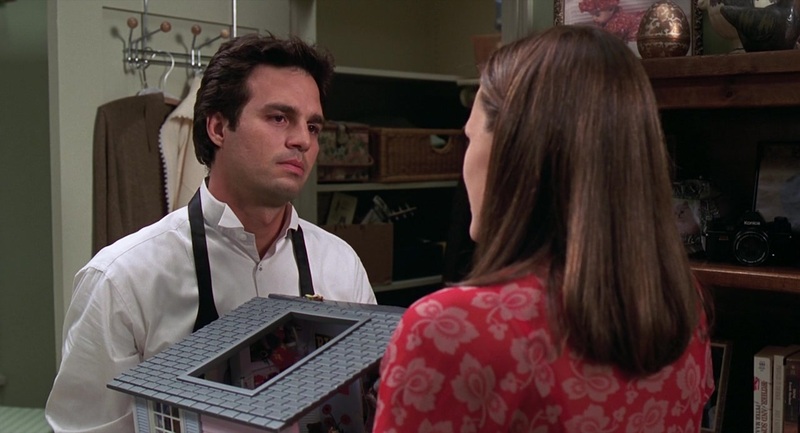 She is the titular girl-next-door, and its so easy to see why Matt (Mark Ruffalo) was smitten; hell, I was half in love with her when the movie ended. I remember watching this, dreaming of the day I would get to have a walk-in wardrobe and shoe collection like Jenna’s. The movie also subtly tackles how the fashion world can affect the way young girls see themselves. Jenna is impatient to grow up, stuffing her bra with tissues and wanting to hang out with the popular girls, all because she wants what all those women in the magazines have. She is dismissive of her 13-year-old body, not seeing the beauty that is obviously there. In a later part of the movie, when she gives the redesign pitch to the team, she makes us rethink what we assume fashion to be. Fashion always comes across as something distant and unreachable, only for the models that inundate our glossy magazine pages. Fashion should be relatable and something we share with each other, which we see reflected in the redesign concept and Jenna allowing the younger girls she befriends to traipse through her closet during a sleepover. When Jenna crashes Matt’s wedding hoping to get him back, he tells her that sometimes you get the dream house, other times you settle for something close to that. This points towards the inevitable settling and compromise we see in adult decisions. Waiting for the dream house could end with you waiting for a fantasy that never amounts to anything. Matt moved on because Jenna didn’t want him, and his choice has taken him so far away from her that there isn’t any way back. This is such a poignant moment in the movie, because we are aware that she is his dream house; after all he made one for her on her 13th birthday. Despite that, he knows he cannot choose her. As much as we believe love is this awestruck sense of knowing, it really isn’t. Love is a choice that is a culmination of other choices. Matt’s path brought him to Wendy and he chose her, and that is pretty much the end of it. One of the reasons why I love this movie so much is that it found a way to give her the painful reality as well as the happy ending. It functions on a kind of multi-verse plot. In the timeline where Jenna achieved all her high school desires, she doesn’t get the “sweetest guy she’s ever known”. For the timeline the movie ends on, she does choose him, and gets the man of her dreams who is also her best friend. Rick Springfield with his brooding good looks singing “Jessie’s Girl”, Whitney Houston’s hip-jerking hit “I Wanna Dance with Somebody” and of course the epic “Love is a Battlefield” by the wonderful Pat Benatar — half the time I am singing along or grooving to the beat. It reminded me of my youthful sentiments, and how adult life has crushed all sense of euphoria and hopefulness. I jest of course (am I though?). I would be remiss not to mention the fantastic ‘Thriller’ dance sequence, even though Michael Jackson seems to be a persona non grata at the moment. As the swirls of nostalgia danced around me, I saw what 13 Going on 30 was trying to show me about life. When we are young, we wish to be older, to move to a future self, in a hurry for all our dreams and expectations to come to fruition. As time pushes us forward and we find ourselves older, we are suddenly struck with a desire to return to the past, a time when things were simpler. We are suspended in a constant paradox, wishing time moves forward and backward at the same time. Thank you for reading! What are you thoughts on 13 Going on 30? Comment down below! I really need to see more romcoms, lol! Hahahaha! You really should. For me, most of my life has been spent obsessing with the idea of falling in love, hence the immense rom-com love. It offers distraction. I guess the animated Disney movies were what I used to get obsessed with the idea of romance, lol! Are you planning to go watch the live-action version of Aladdin? Once it comes on DVD, yeah, for my blog. I watched this the day I turned thirty. I’m 33 now. To say life hasn’t turned out how I expected is kind of an understatement, but I think the film is so magical because it explores the possibilities that we have in every single day. I love the character of Jen’s assistant. I can’t think of her name right now, but she’s in a ton of things. Anyway, towards the end of the movie she realizes that she’s pretty amazing and that she deserves more. Also loved thirteen-year-old Becky from the elevator. She’s hilarious and acts just the way I would toward a stranger who “has never said hi to me before” at thirteen. I was 18 when it came out (Mean Girls also came out that year) and loved it. 2004 was a great year for teen movies. We both watched it when we turned thirty haha. Rite of passage am I right? Its weird how it is both a teen movie and not a teen movie. A lot of the themes are very adult but also reflect on the process of growing up. I was 28 when this movie came out! Hard to believe time goes by that quickly! I loved this movie so much when I was younger – I have an old journal where I wished my best friend & I were 30 in it because of it!